Here at StaxUp Storage, we know our success is due to our wonderful team. The care they give our renters is unparalleled and we want to highlight their milestones along the way. 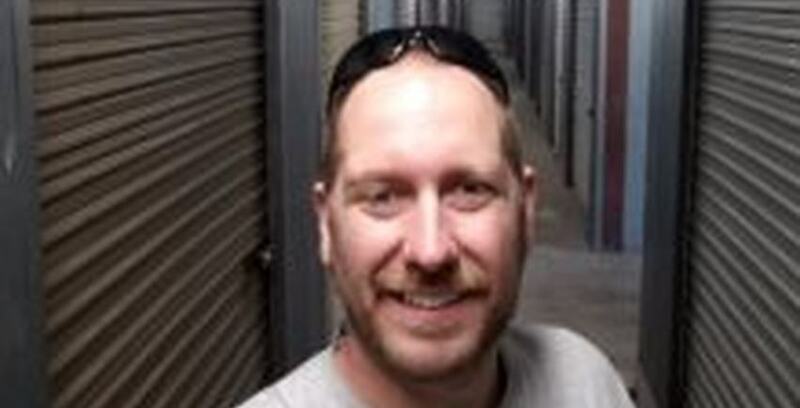 Below is an interview with San Diego team member Ross McLoughlin, who is celebrating his 3-year anniversary with StaxUp Storage this week. All interviews are performed by Peter Soto. Ross is a member of our build team and contributes to the success of our both our apartments and self storage in southern California. Ross McLoughlin of the Stax Up Self Storage California build team. He has just finished installing the lights in the background. Peter: I appreciate you giving me a call. I just have a few questions to ask you for your work anniversary. This is your three year anniversary, right? Ross: Yes, it’s the third year. Peter: How did you get involved with us? Ross: Well, I’m not with the self storage side per say. I’m on the build team here in California, which is part of the housing side, the apartments. It’s funny. When you called I was in Chula Vista installing about $40,000 worth of lights. Peter: That’s the really big one with like 1800 units, right? Ross: It’s huge! It has like 20 buildings. I don’t even know how many units. The lighting project we’re working on was pretty big. It turned out great. We switched over from fluorescents to LEDs. It’s all eco-friendly now. Peter: How long did it take you to do that project? Ross: Oh, roughly about 12 days. Peter: How would you describe your role on the team? Ross: I’m the electrician on the build team for [Strategic Property Management Incorporated] in California. Which is part of the maintenance team, but I do most of the electrical for the company. Peter: So do you live down in the San Diego area? Ross: My wife actually manages one of the apartment complexes, so we live in the area. Peter: I’ve heard that’s a pretty good deal. StaxUP Storage in Chula Vista, where Ross recently completed a large lighting project. Ross: They’re very fair. We don’t take advantage, but we are definitely earning our keep. They actually offered me the job, but I was so busy already. My wife wasn’t working at the time, so I told her to contact her and they ended up really liking her. We’re kind of a team. I’ll help her out if I have to, but for the most part it’s her thing. Then I do the electrical and sometimes the maintenance team calls up or the self storage team calls me with problems or questions. I love it. It’s a lot of fun. Very busy 100% of the time. Peter: I’ve only been to San Diego a few times. Do you know about anything only locals would know about? Ross: Well, I was born here, but I have lived in San Diego continuously for the last 15 years. I’d say the Silver Strand Beach over in Coronado is the cleanest beach with the least amount of people on it. Everybody goes to Mission Beach or Ocean Beach and fights the crowd. If you’re looking for a place to get away, that’s the place to go. There are some cool little shops over there. Then you hit the beach and it’s just wide open beaches without anybody on it. It’s fantastic. Peter: Are there any restaurants you prefer in the San Diego area? Ross: Oh, gosh. Mona Lisa Pizza in Little Italy is fantastic. Then there’s also Soreno, which is an Italian restaurant in Little Italy as well. It’s more upscale. It’s real nice. Peter: Nice. Do you have any hobbies people in the company might not know about? Ross: I love going to the movies with my son. My son is 6 and he likes to do all sorts of fun adventures. He’s real big on going on adventures. “What adventure are we going on today?” We’ll walk the canyons with a metal detector or go down to the beach and let him have some fun with it. We discover “treasures” as he puts it, which is usually trash, but, you know, when you’re 6 you find something and it’s a treasure. It’s an adventure and he likes that. Peter: It’s important to get outside when you’re a kid and do outdoorsy stuff. I feel like a lot of kids now a days are too into technology. Ross: We limit his phone and iPad use to less than 10 hours a week, because the technology can be like heroin. The flashing lights and instant gratification actually stimulates the same parts of the brain as heroin. We’ve noticed that if we let it go uncontrolled and unchecked that he gets really grumpy and angry when anything disturbs him, so we don’t let him play at certain times, we don’t let him play in the dark, we don’t let him do a lot of things that we would normally consider letting him do and it makes it a lot easier for us. We still let him do it, just in moderation. Peter: Moderation is very important. Well, those were all of my questions. Now, at the end of these I always ask if there is someone you would like to give a shoutout. Is there anyone you want to give some props to? Ross: I would like to thank Collin who is the head of the build team. He’s my boss and he is fantastic and he puts up with all of my idiosyncrasies. He allows me to have enough work to almost go crazy, but he knows how much I can handle and that’s important.